Jeep Wranglers are known for their off-road capabilities,-the simplistic design, tough underbody and solid axles allow owners to venture off the paved path into tougher terrain. Once the snow melts and the days get longer, it is a great time to do a thorough inspection and cleaning of your Jeep Wrangler. Here are the top areas you need to hit. With 2014 coming to a close, it is time to make those New Year resolutions! While weight loss usually tops many lists, we have different goal in mind. Here is out top resolutions for true off-road enthusiasts. After a long day wheeling around in your Wrangler, the last thing you may want to do is wash it off. Yet, this is exactly what you should do. Here’s why. Jeep Wranglers are extremely tough machines that can take you through some pretty serious terrain. Unfortunately a stock Wrangler may not be properly equipped to handle a zombie apocalypse and will need some mods to ensure your survival in a battle against the undead. If you want to survive the war against the undead you need to be able to keep moving, defend against zombies, repair your vehicle and crush those flesh munching infections into mulch. Here’s the Jeep parts you’ll need to do it. 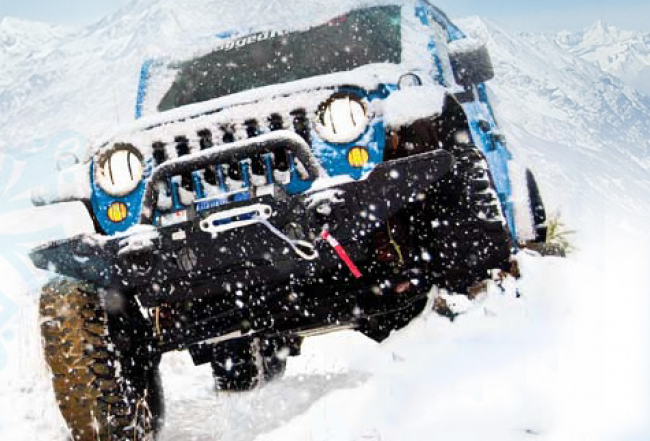 When old man winter starts sending cold blasts, it is time to think about your winter Jeep Wrangler modifications. Besides, basic winter driving skills, our top 5 modifications are great additions to help you get through the season easier.